Has a small leak in your roof stained your ceiling? Do you have a textured or popcorn ceiling that is dating your house? Mendoza's Paint & Remodeling can help. Ceiling painting is tough work. It is much more labor intensive than wall and trim painting. However, the results are often rewarding. Ceilings are not typically noticed until they become stained. The bright white of ceilings dulls over time, due to collection of smoke, grime and air flow through the home. When they dull over time, and ceilings are painted, people notice a brighter, cleaner room. If you have neglected your ceiling, call Mendoza's Paint & Remodeling at (832) 422-7555 to brighten it up with a fresh coat of paint. Not to worry. Your dingy ceilings can be revived quickly and inexpensively. Mendoza's Paint & Remodeling is a leading provider of ceiling painting services. Our expert ceiling painters have years of experience and can make your living room, bedroom, family room, kitchen, and office ceilings look new again. You'll be amazed that the transformation that a fresh coat of ceiling paint can add to a room. Call (832) 422-7555 today for a free consultation and quote. The painters at Mendoza's Paint & Remodeling begin by preparing the ceiling. Professional painters agree that preparation is the key to success. First, we remove old flaking paint and wash dirty areas. Next, we fill in cracks and dents, and sand rough areas. 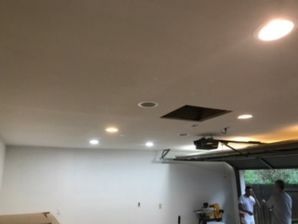 if the ceiling is stained, we'll apply concealing primer that won't allow the stain to bleed through. Finally, after properly protecting your flooring and furnishings, we'll apply quality ceiling paint to create a long lasting ceiling finish. Having 18 years of experience, the painters of Mendoza's Paint & Remodeling will have all your ceilings looking fresh and rejuvenated in no time. Call us at (832) 422-7555.